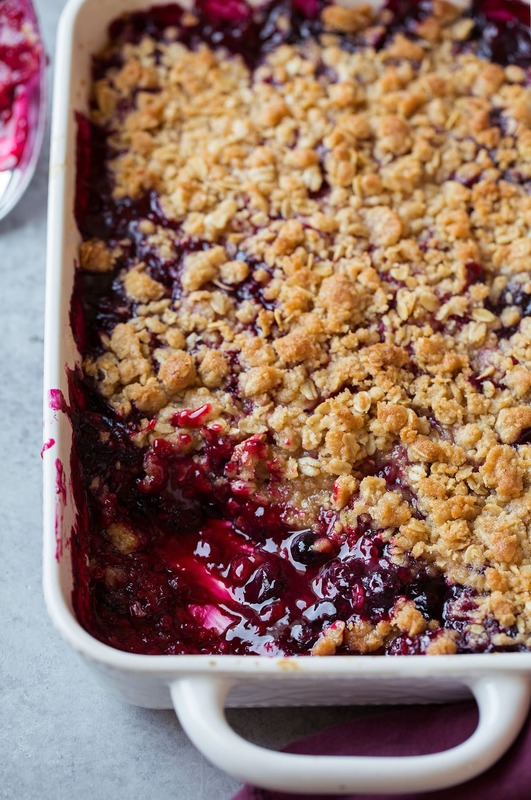 This Triple Berry Crisp is definitely worthy of making it to the list of favorites! 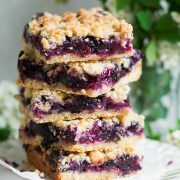 A flavorful, fresh berry base is topped with a decadent oat crumble and no one will be able to resist! It’s easy to make and even easier to eat and fall in love with. A Must Try Berry Crisp! 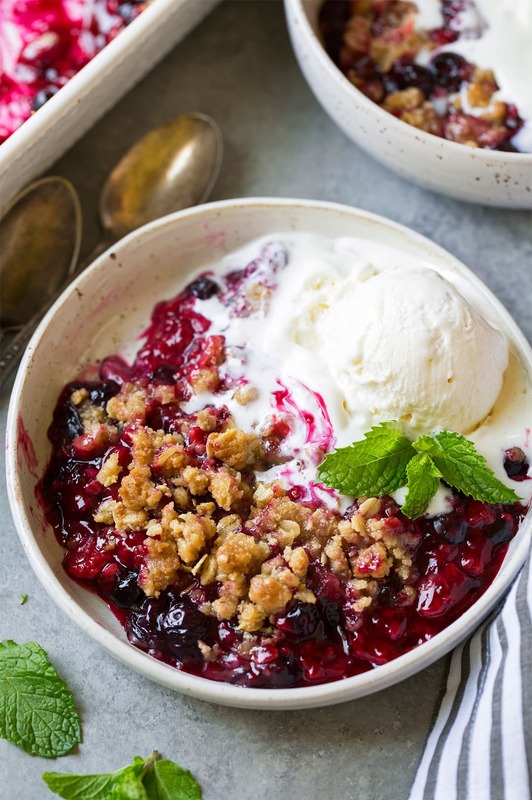 This fruit crisp is made up of mostly berries (which I’m obsessed with), then it’s adorned with the most delicious crispy, sweet, buttery, oat filled topping and finished with a generous scoop of rich vanilla ice cream. Yes, and that vanilla ice cream is a must! It adds to the sweetness and it balances out the light tartness of the berries and polishes it off with that berries and cream flavor combo. This is how you do summer! Preheat oven, butter baking dish. Whisk together flour, oats, brown sugar, granulated sugar, cinnamon and salt then cut butter into mixture. Chill. Rinse and drain berries. Transfer to baking dish. Whisk together sugar and cornstarch, toss mixture with berries. Sprinkle crumble evenly over berries. Bake in until filling is bubbling and topping is golden brown. I’m sure in the winter this would also work with frozen berries. I’d just add them in frozen (skip rinsing) then add more time as needed. I know when that times rolls around for me I’ll definitely be going that route when I can’t get good fresh berries, but for now I’m alllll about those fresh summer berries and this has got to be one of the best uses for them! Now just pass me the pan and a spoon please :). 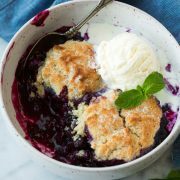 This fruit crisp is made up of bright, fresh berries, then it's adorned with the most delicious crispy, sweet, buttery, oat filled topping and finished with a generous scoop of rich vanilla ice cream. Preheat oven to 375 degrees. Butter a 9 by 9-inch or 11 by 7-inch baking dish. 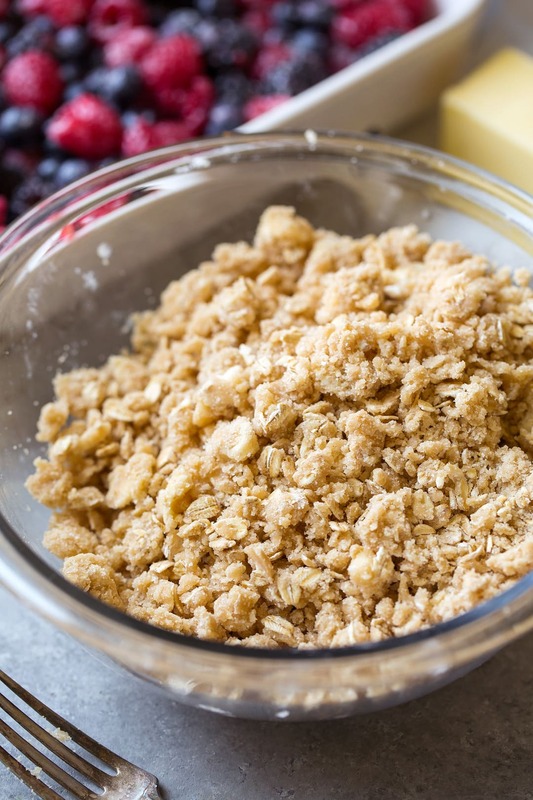 For the crumble: In a mixing bowl whisk together flour, oats, brown sugar, granulated sugar, cinnamon and salt. Add butter and cut into mixture using a pastry cutter or fork (or rub with fingertips), until mixture resembles coarse crumbs. Transfer to refrigerator. For the filling: Rinse berries and let drain (but don't dry). Transfer to baking dish. In a small bowl whisk together sugar and cornstarch. Pour cornstarch mixture evenly over berries then toss to evenly coat. 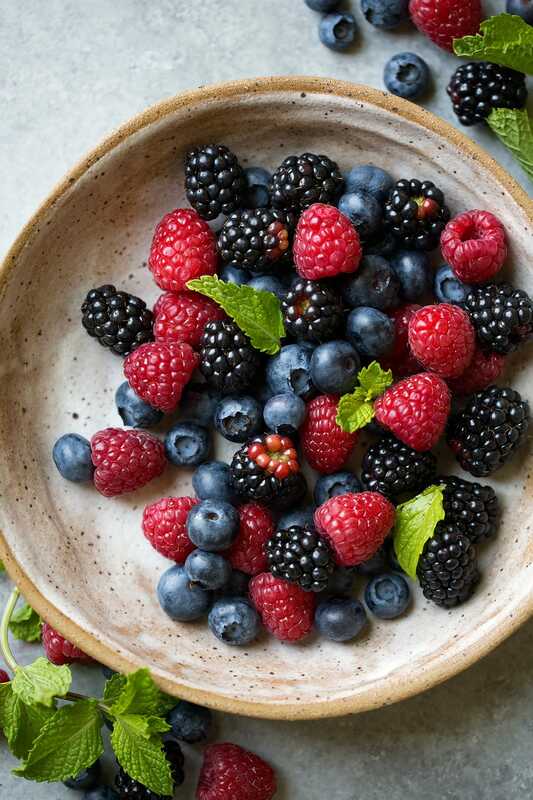 Remove crumble from refrigerator and sprinkle evenly over berries. Bake in preheated oven until filling is bubbling and topping is golden brown and crisp, about 30 - 35 minutes. Serve warm with vanilla ice cream. Iris: I have an abundance of apples from my tree. I wonder if I could use them instead of berries?